March 13, 2018 - A Cincinnati native, he is an up-and-coming R&B artist in Chicago. Fusing R&B with his love for Jazz and hip hop, his unique sound/style has garnered the attention of JET, ABC's Windy City LIVE, Soultrain.com and Cincinnati's #1 radio station, 101.1 The Wiz, to name a few. He released his debut EP, The Ruff Draft, in January 2016 which debuted in iTunes Top 100 on the R&B/Soul charts. Since its release, he’s been awarded great opportunities, such as ... See More opening for Grammy-award winning artist Chrisette Michele, Teedra Moses, K. Michelle, Ginuwine and R&B group, Dru Hill. He was also selected to headline the Bud Light stage, opening night, at the 2017 Taste of Chicago. Now with his new EP on the way, entitled Harvey Ave., he is showing no signs of slowing down! 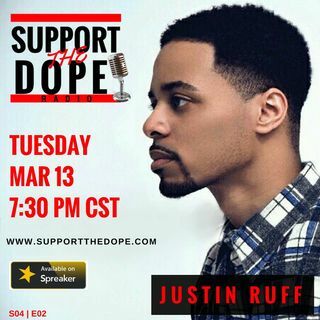 Tonight's special guest is none other than the smooth, the soulful, singer/songwriter... Justin Ruff! !